If you're looking for knee support while also allowing flexibility and your skin to breathe, an elastic knee brace may be the answer. Many athletes use elastic knee braces for training and competition because they allow for quick movements while also restricting movement enough to avoid serious injury. Some of these knee braces also have some padding and are easier to put on than standard knee braces as they simply slip on to your arms or legs. 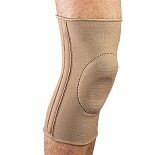 Walgreens.com carries elastic knee braces from the brand OTC Professional Orthopaedic.